#1.1 10 Best Nightstand Gun Safes on the Market! Firearms are extremely important and they can do extreme damage when left in the wrong hands. Most of us already know how important gun safes are in case of emergency, but people still tend to ignore this important factor and they keep their guns hidden inside the house. Of course, if you are going to have a firearm it is essential that you take the appropriate measures to ensure that you are safeguarding it. This is why it is essential that you get yourself the best nightstand gun safe to protect your firearms. Nightstand gun safes are designed to not only give you some extra security but also help you to being able to grab them at a moment’s notice. They offer another dimension of security to your guns and will offer you the added benefit of never having to fear a burglar. 10 Best Nightstand Gun Safes on the Market! Not every gun safe is as good as others, so choosing the right option for yourself is important. If you put in some time and do a little research, it will become much easier to buy a good nightstand gun safe and get value for your money. Luckily, I have done all of the research for you and come up with a few safes that I believe will give you perfect quality. 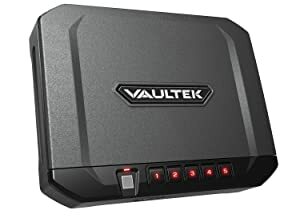 Vaultek VT10i Biometric Smart Safe is the ultimate multi-functional and multi-purpose safe. The safe is big enough to house Glock 17, but unfortunately, a Desert Eagle may be a little too big for the safe. You will still be able to add jewelry with your firearm and the protective foam mat on the inside will protect your jewelry if the safe may fall or if someone drops it. The interior design is intended to allow easy and quick access. This will in turn also enable you to add more items into the safe with your firearm and make this the perfect safe to keep in your car, drawer and even in the office. The lightweight structure is perfect for putting the safe in your car and your drawer at home, but if you want to secure the safe, you can easily mount the safe to any will or object using the high-quality cable to tighten your safe. This safe is designed to be used in any location and can even be used in a car to protect you and your firearm. The steel frame has been tested through rigorous condition and the steel has been forged at extremely high temperatures to ensure that no one can pry open your safe. The high-quality steel will also keep out any erosion and your safe will keep everything dry in the event that water may spill on it. Furthermore, the safe has been designed to fit into the glove compartment of most cars and this will be perfect for hiding or disguising your safe from prying eyes. The biometric finger scanner has been made to make sure that your finger can be scanned from any direction and the software will adjust to your finger, making it easier to use with every attempt. The safe can house up to 20 fingerprints and the first three are considered to be the admin fingerprints. These administrators will have the power to remove any fingerprints that are no longer in use and may not need any further access. The safe will also arrive with two backup keys to easily override the fingerprint scanner in case it may malfunction. The software and onboard computer is powered by a rechargeable lithium-ion battery that will last up to 3 months and will save you the cost of batteries that could break or not be of high-quality. On the downside, you may loss control over the fingerprint scanner when the battery goes down and the safe will require you to use the override keys. This will sometimes leave you in doubt once the battery starts to deplete and it may be a good idea to keep the keys close by at every opportunity. Overall this safe is perfect for multi-functional use and you will have the ability to move the safe from car to drawer easily. 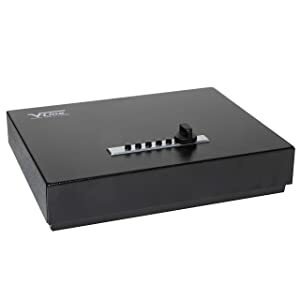 We recommend that you secure the safe with the high-quality and extremely durable cable that is provided to ensure greater security and less chance of theft. This will certainly be a great buy for any handgun enthusiast and someone that does not yet own a safe. Designed to keep only one firearm, this safe can also be used to store all the valuables that you have. The safe is small and compact and can easily be used as a car safe as well. The safe may not be that big on the inside, but it has the capabilities of carrying exactly what it needs to and everything on the inside will be protected from impact with the padded foam interior. No hinges are present on the outside, thus allowing you to safely mount the item without the fear that someone might try in pry open the safe. This will leave you with a small safe that has virtually no weaknesses. The safe has been designed from solid steel with an added metal coating that will help protect the safe from impact and any external damage like rust. Smaller safes like this safe have been specifically designed to withstand impact and to ensure that you have some of the best quality need in your safe. With this design, it will make prying even more difficult and once the safe has been mounted, the safe will become denser and center all of its mass to make it virtually impossible to move and giving you added peace of mind. Aside from the mounting feature that will greatly benefit you, you will also be able to use the combination mechanical locking feature, no more worrying about batteries that may die or even technology that may fail you, you will be able to manage this safe with a simple combination. The safe has 1081 different locking combinations. This is ideal for people with children and will ensure that children cannot for open the safe or accidentally stumble across the key. Once it is mounted, children will not even be able to move the safe, thus adding to the security. The safe is quite affordable and you will receive all of the necessary tools required to mount the safe upon receipt of the item. The safe can be mounted anywhere in the house and you will only need some basic mechanical tools to do this. The safe has also been approved by the California Department of Justice, thus giving it more credibility and ensuring you that when you buy the safe, that you have made an investment. The safe will definitely pay itself over the multiple years of use that you will get from it and the multi-functionality. We highly recommend this safe for homeowners and travelers alike. The reason we like to encourage travelers to buy the safe is that it is small and compact and can easily be moved from place to place and mounted in some of the impossible places. The safe does not require any batteries and this may be a great relief for anyone not looking to spend more money on the safe in the future. 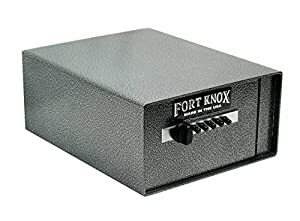 The Fort Knox Personal handgun safe is just as the name says. It is big enough for one handgun and the fully carpeted interior will ensure that the firearm on the inside will never sustain any unnecessary damage from impact. You might be able to add one box of ammunition to the inside of the safe, but we think that the safe should be perfect for men to store their valuables as they tend to have less jewelry than women. This safe can become the ultimate man box. The safe features a 10 gauge steel constructed frame and the door is a little thicker at almost 4 inches. This will ensure that no one can break open the safe when it is bolted down with the mounting equipment that has been provided. The exterior has also been powder coated to allow you to mount the safe in your car or any place that has high humidity or a lot of water in the air. This will ensure that rust never sets in and that the outer shell is protected from damage that may occur, should the safe experience any sort of impact. The safe features a combination locking system with up to 1081 different locking combinations to ensure that the combination cannot simply be guessed. This combination locking mechanism will trigger the durable inner live action bolt to secure all of the items on the inside tightly. We recommend that you mount the safe to the ground as it is quite light. This will add another dimension to the in the way of weight and ensure that no one can walk away with you safe. If you do not yet own a gun safe, this definitely will be a lifetime investment. The safe will provide you with multi-functional use and you will be able to mount the safe in multiple locations. We highly recommend the safe to single gun owners and men that are highly enthusiastic about safes. The safe could become the ultimate man box in your vehicle and you will definitely have peace of mind any optimal security when carrying your firearm. While the interior may not seem that important to everybody, it could actually play a very important role in the security and the protection of the items inside the safe. The interior of this safe has been foam padded. This means that the items on the inside will have the added benefit of being protected against impact and you will be able to place your firearms inside next to items like jewelry. The inside also features built-in shelves. Unfortunately, these shelves cannot be removed, but they have been perfectly spaced apart to allow you maximum storage space and making it easy for you to store all your valuable items. The exterior has been crafted from solid steel and added resistance had been placed on the door to ensure that it cannot be broken open. The safe has been designed to make life as hard as possible for people looking to pry and with the hinges that have been designed on the inside, they have managed to do this perfectly. 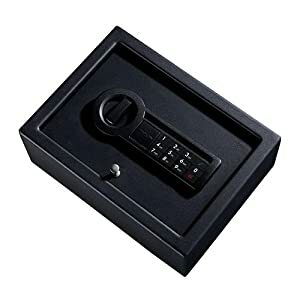 The safe is only available in one color and the color is black, but that should not be a problem as the design and the color makes it perfect for ensuring that no one can damage or scratch your safe. Emphasis has been put on resisting damage from possible falls and scratches. The safe incorporates a modern and advanced electronic locking system, but you will also receive two backup keys, should the batteries die or if any manufacturer defect may influence the locking mechanism. The locking mechanism will automatically timeout after three incorrect attempts, thus slowing down anyone trying to guess your code and making it impossible for children to force open the safe with multiple guessing attempts. With the safe, you will also receive all the mounting hardware and the already pre-drilled holes; these should make it easier for you to determine the best spot for putting your safe and allow you the ease of mounting the safe yourself. The safe also meets the requirements set into motion from the California Department of Justice to ensure that you have a quality safe that can protect all your valuables, while still offering you fast and effective access to protect your family. The safe, unfortunately, does not feature a backlit LED light for the keypad and this may make it harder to use during the night times, but fortunately, you will be able to purchase these separately for a very low price. We highly recommend this safe in any household. The safe is not that large and it is very compact and portable. The electronic locking mechanism will ensure that you have quick access, making this one of the best safes for keeping close by. The safe can also work perfectly for storing money and restaurateurs should definitely take note of the safe at its affordable price. To get the most value from a gun safe, you have to weight up a few of the key features. These features need to make the amount of money that you are spending worthwhile. I have picked a few features that will make a huge difference and provide you with a lot of value. Steel Quality. The quality of steel that a safe is constructed with will play a huge part in the type of protection that it offers. I recommend anything between 12 and 18 gauge steel safes as they have proven to be resistant against most equipment that is commonly used by intruders. Lock type. If you are paying a lot of money for your safe, you would expect that the safe has a strong, but still easy to open locking mechanism. You will have the opportunity of choosing between the biometric, mechanical and electronic locking features. The biometric locking feature is much more expensive, but it does offer a lot of quality. Size & Capacity. Bigger gun safes are generally more expensive and will also cost you more maintenance in the long run. A smaller gun safe will do just fine if you only plan on protecting a small firearm and a few valuable items. Hunters will be looking for the more expensive and bigger safes. Pry-Resistant Features. It would be extremely good for you if you can do some research on the type of equipment that is used by intruders when they try and break open safes. Once you have some knowledge about the topic, you will be able to make a better choice on your gun safe and even have some added security features installed. I recommend that you make sure that the hinges are on the inside of the safe when purchasing as this is one of the first places that intruders target. Mounting Features. The mounting features are extremely important and this will vary depending on the safe that you choose to buy. The smaller and portable safes will have a strong wire that it mounts with and the larger safes will use deadbolts to keep the safe in place and secure. We highly recommend the deadbolts as they will provide added security.